WEST LAFAYETTE, Ind. — The annual Black Cultural Center Friends and Family Day will bring New Orleans tradition and culture to the Purdue campus on Sept. 20 as the center focuses on the impact of Hurricane Katrina on the retention of African-American art and culture as their theme for the fall semester. The public is invited to attend. The Hot 8 Brass Band from New Orleans will lead a procession from Ross-Ade Stadium to the Black Cultural Center, 1100 Third St. Participants are asked to gather under the Boilermaker bronze statue immediately following the Purdue-Central Michigan football game and march as part of the “Second Line” parade to the center. The “Second Line” is a tradition that dates back to the 1890s and is often associated with jazz funerals. Serving as grand marshal for the center’s “Second Line” parade is Black Mardi Gras Indian Irving “Honey” Banister. 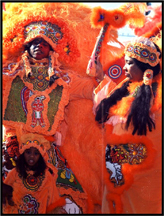 The Black Mardi Gras Indian tradition came from an alliance between enslaved Africans and Native Americans. Historians said that tribes such as the Choctaw, Seminoles and Chickasaws in Louisiana helped enslaved Africans and men of color survive in the swamps after they escaped the plantations. Upon arrival at the center, attendees will enjoy a sampling of New Orleans cuisine, children’s activities, beading and a mask-making workshop. The Hot 8 Brass Band will perform Hip Hop, jazz and funk style music. New Orleans, influenced heavily by African-American musicians, developed a style of brass band music that has been distinct to the city since the late 1880s.